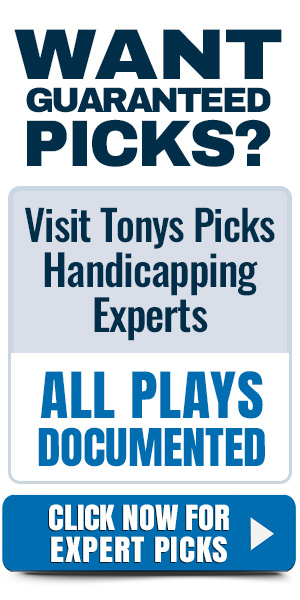 Free Picks Predictions Previews and Live Odds by expert professional handicappers who research and analyze pro and college games against the point spread. Betting tips include parlays, teasers, and over under totals.Proven methods and techniques are applied during handicapping process.Handicapping team has compiled several years in the sports advisory business and have many satisfied clients.Bettors will have ample time to get their wagers in at their preferred destination. As a result transact bets quickly with rapid delivery of sports information.This is not a gambling site but an information source for pro and college sports from a wagering angle for betting legally on games.Visit our social media channels to gather valuable content in additional to website content.Social media readers will observe strong presence of subscribers.Notably on Facebook, You Tube and on Twitter by searching #TonysPicks and please subscribe.Visitors find updated fresh content with free picks everyday listed on our home page.Displayed is our content throughout social media platforms. Free MLB Picks For Today 4/21/2019 More MLB Picks Predictions Previews San Francisco Giants vs. Tampa Bay Rays Pick Prediction 4/21/2019 Giants at Pirates—MLB pick is San Francisco Giants and Pittsburgh Pirates to play under the total of seven runs. Pittsburgh pitching has been outstanding as in their past nine games have held their opponents to three runs or fewer. Chris Archer takes the hill for the Pirates. He has an ERA of 2.00 and WHIP of 1.00 in 18 innings of work. He held the Nationals in his last start to one run and four hits over seven innings….